Abdias Ashton graduated BA from St John's in 1582, MA in 1585, BD in 1592, and was elected a Fellow in 1590. He was ordained deacon and priest at Peterborough in 1591, and was chaplain to the Earl of Essex, before becoming rector of Halesworth in Suffolk, and then moving to parishes in Yorkshire, and finally Lancashire. Ashton gave 100 marks to the Library to buy books of ‘the fathers or new writers as they think fit’. This seems to be what happened, as the 100 or so books bearing his book label are in the main 16th-century theological works, including numerous editions of Hebraica. 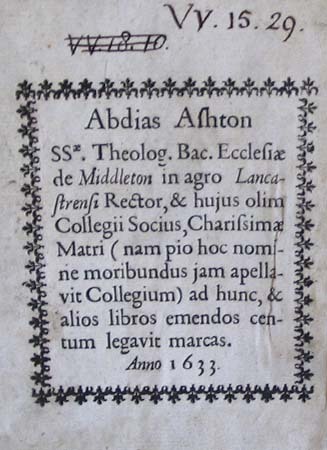 Abdias Ashton, Batchelor of Sacred Theology, Rector of Middleton in the county of Lancashire, and once a Fellow of the this College, bequeathed 100 marks, to purchase this and other books, to his most dear "mother" (for by this affectionate name did he refer to the College as he was dying). In the year 1633.